West advances to play host Tallmadge after defeating fellow District 11 team Symmes Valley Monday evening. Youth softball in Scioto county has never seen more success than it has over the last few weeks. The West Portsmouth 9/10s win their state tournament game against Symmes Valley Monday evening by a score of 9-7 in Tallmadge, Ohio. This makes the second time this postseason that West has defeated Symmes Valley, previously doing so in their District 11 title game. The bats came alive for West early and often as they jumped out to a 6-2 lead after two innings. Sydeny Kammer had a clutch single for West that really jump started their offense in Monday night’s game. West had a 9-5 lead heading into the final half inning, before a comeback by Symmes Valley brought them to within two runs. Although they could not complete the comeback, West head coach Brandon Entler had high praises for the Vikings. “I hate that we had to knock out another District 11 team” said Entler, “But I feel like both teams represented District 11 very well.” West pitcher Maci Bradford recorded a win and a save in the game after previously exiting the game, and then reentering once her team was staring down the barrel of a Symmes Valley comeback. In their two previous games in Tallmadge, West defeated Ashtabula 10-0 Saturday morning, and lost to Canfield Sunday morning 3-2. In their two wins at the state tournament, West has outscored their opponents 19-7. In order to keep advancing through the field, West knows it has to keep the offensive production alive, supported by excellent pitching and defensive efforts in the field. 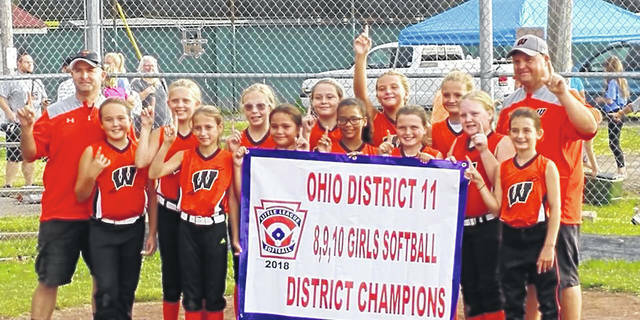 This victory comes only a day after West’s 11U team won the state tournament in a victory over host Tallmadge 10-3, and three days after the Wheelersburg little league softball team won the Central Regional championship over Iowa 3-1 to advance to the Little League Softball World Series. West is one of the final four teams left in the state tournament, joining host Tallmadge, Austintown, and the team that they lost to in their second game of the tournament, Canfield. In this double elimination tournament, if they are able to advance to the championship, West would need to win two games against the team they would then face in the championship game. West’s 9/10s team will next face host Tallmadge Tuesday evening at 6 p.m. “They’re the local team, we got to watch them play earlier” said Entler, “We just have to go out and do what we’re supposed to if we want to win.” If West were to win tomorrow, they would face the loser of Austintown and Canfield at 6 p.m. Wednesday evening. Anyone wishing to follow along with the 9/10s team can download the “Tourney Machine” app on their smart phone or visit tourneymachine.com and search for “Tallmadge, OH”. The results will show a page for both 8-10 and 9-11 year old Little League state tournaments. Although the 11U team already won the state tournament, the 9/10s team will still have daily updates for their games as the team advances. https://www.portsmouth-dailytimes.com/wp-content/uploads/sites/28/2018/07/web1_8_10districtchamps-1.jpgWest advances to play host Tallmadge after defeating fellow District 11 team Symmes Valley Monday evening.